You see, according to The Huffington Post, Shayne and his mom were hit by a car in Queensland, Australia back in August. We’re NOT crying, you’re crying!! 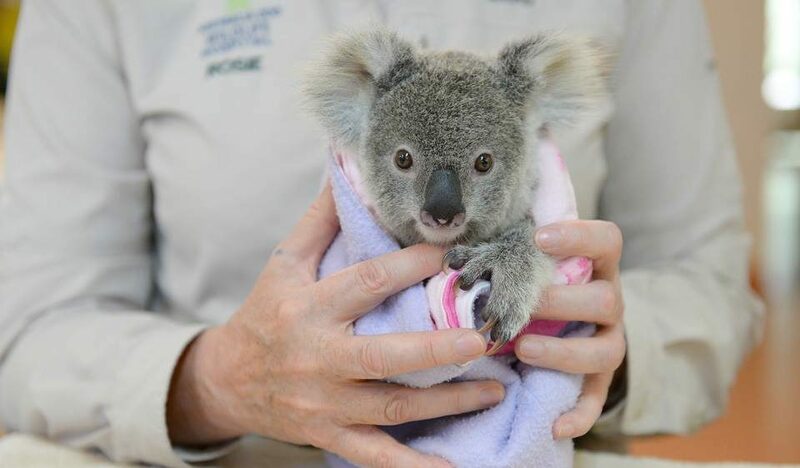 Luckily for Shayne and for us, the baby koala was found by a good Samaritan who rushed him to the Australia Zoo Wildlife Hospital. The kind hospital staff then tended to his injuries, both emotional and physical. For the emotional pain, they provided the little guy with a plushy koala bear for him to latch on to. The stuffed toy has become a cuddle buddy and a sort of replacement mom for Shayne, who’s still trying to cope with the sudden loss. The strength the stuffed animal gives him is helping the young koala prepare for life after the hospital. And once Shayne has mastered the art of climbing, making friends (something we’re still trying to figure out), and all the other koala activities, he’ll be released into the wild to start his own koala family. We’re rooting for you little guy! To help prevent koalas and other animals from getting hurt in the wild, Booth said Australians (and all of us, for that matter) should be mindful and slow down when driving through wildlife habitats, particularly at night.